This book includes sheet music for all 101 songs. An enclosed CD-ROM also includes an abundance of resources for worship leaders, songwriters and musicians - including printable chord charts for all of the songs, over 100 printable articles and magazines, plus video and audio interviews with many of the creative minds from the Vineyard and more! Printable chord charts for all 101 songs in this book in the original key plus an alternate key for each song. 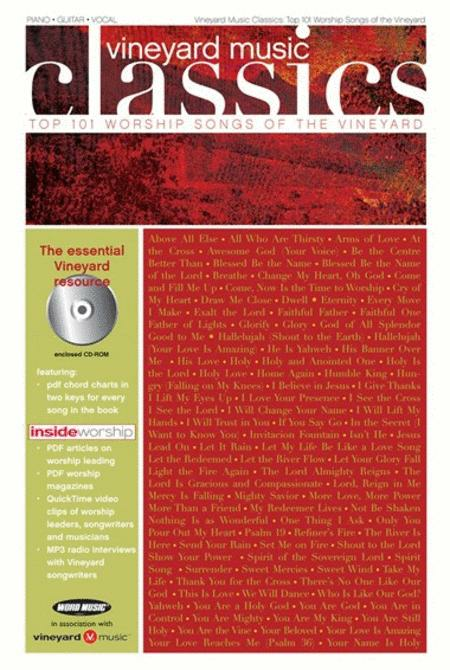 Over 130 PDF articles from the pages of INSIDE WORSHIP Magazines. Topics include: Leading God-centered worship, selection songs, tips for musicians, essential habits of worshipers, living creatively and more! Magazine Archives - Several complete issues of INSIDE WORSHIP Magazine in PDF format. Topics include: Freedom in worship, playing guitar and percussion, creativity, worship leaders and pastors, discipleship and more! Topics include: The focus of worship, inspiration for songwriters, making worship accessible, scriptural resources, leading in small groups and more! So much good music to choose from; works well for small groups, worship teams. provides full keyboard notation, chords, lyrics, harmonies... just a great resource. Written in good keys. This is a wonderful compilation of songs often used in worship. I know that when I take this book with me (Vineyard Music Classics) I have an excellent repertoire in one cover. I will not hesitate to order more in the future as needed. 35 of 56 people found this review helpful.